This year has been one to remember in Orlando. There have been a bunch of great new restaurants that have opened, as well as some well needed market places. 2016, however, will be the first year of several in a row that will be delivering hot new attractions. There's going to be new rides and venues opening at a bunch of different theme parks across Orlando, but I'm just going to talk about the 3 that are getting the most attention right now: "Skull Island: Reign of Kong" at the Universal Orlando Resort, "Frozen Ever After" at Disney World's Epcot, and "Mako" at SeaWorld Orlando. It's Kong's world, and Universal is going to be taking fans there starting late Spring / early Summer in 2016. What's pretty cool about this is that they're going to be opening before the mega blockbuster movie premieres in 2017. For more information, check out our previous post here. This is going to be big! 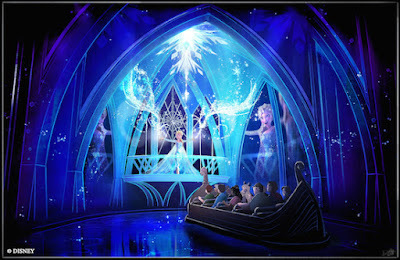 The long defunct Maelstrom ride at the Norway Pavilion in Epcot is being turned into the kingdom of Arendelle. Visitors will be walking into a Norwegian wonderland, being able to participate in the Winter in Summer Celebration, visit Elsa's Palace, and even have a meet and greet with Elsa, Anna, and other Frozen characters. For more information, check out our previous post here. There are roller coasters, and then there's hypercoasters. Mako will be opening in the early Summer of 2016, and will be SeaWorld's first new coaster since Manta opened in 2009. The ride will be the anchor of a brand new shark themed area, 200 feet high, reach speeds of 73 MPH, and will be Orlando's most extreme coaster. For more information, check out our previous post here. So, that's some of the bigger stuff we can all expect in 2016. But, what is on the horizon for 2017 you ask? Even more awesome new attractions; Star Wars Land at Disney's Hollywood Studios, Toy Story Land also at Hollywood Studios, and Volcano Bay, which will be taking the place of Wet 'n Wild, are all scheduled to open their doors for us in 2017.